This past week, reports began flowing in of an agreement between the United States and the European Union concerning the long-standing dispute on beef. 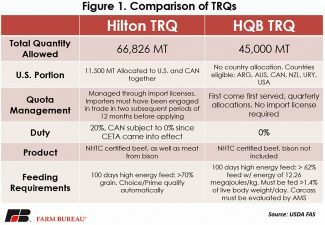 We're hearing the U.S. and the EU have reached an "agreement in principle" on allowing the U.S. a guaranteed share of the EU's annual 45,000-ton quota for hormone-free, high-quality beef imports. The U.S. and the EU have a long-standing dispute over the EU's decision to ban hormone-treated meat. This disagreement has led to a range of dispute settlement proceedings and discussions with the World Trade Organization, with the U.S. contesting the EU's decision to ban hormone-treated meat despite the overwhelming scientific evidence that this product is safe for consumers to eat. The EU currently restricts most meat imports to a limited quantity of beef that is certified as produced without the use of hormones. Fully implemented in 1989, the EU ban covers six growth promotants that are approved for use and administered in the U.S. The ban permanently covers one hormone — estradiol — 17β- and provisionally bans five other hormones. In response to the ban, the U.S. instituted retaliatory tariffs on EU imports, and by 1996 both the U.S. and the EU had requested WTO consultations in an attempt to resolve the dispute. In August 1997, the WTO settlement panel released its report, agreeing with the U.S. that the ban was in violation of the WTO's sanitary and phytosanitary agreement, which both the EU and the U.S. must abide by. A WTO appellate body later confirmed that the ban violated the EU's obligations, but gave the EU the option of conducting a risk assessment of hormone-treated meat. Following this decision, the EU commissioned several research studies that it used as a basis for justifying the ban, claiming to have conducted a thorough risk assessment into the issue. U.S. trade and veterinary officials, however, rejected the studies, noting that the evidence presented did not establish a risk to consumers from eating hormone-treated meat. Furthermore, according to the U.S., the EU ignored numerous scientific studies demonstrating the safety of eating hormone-treated meat. 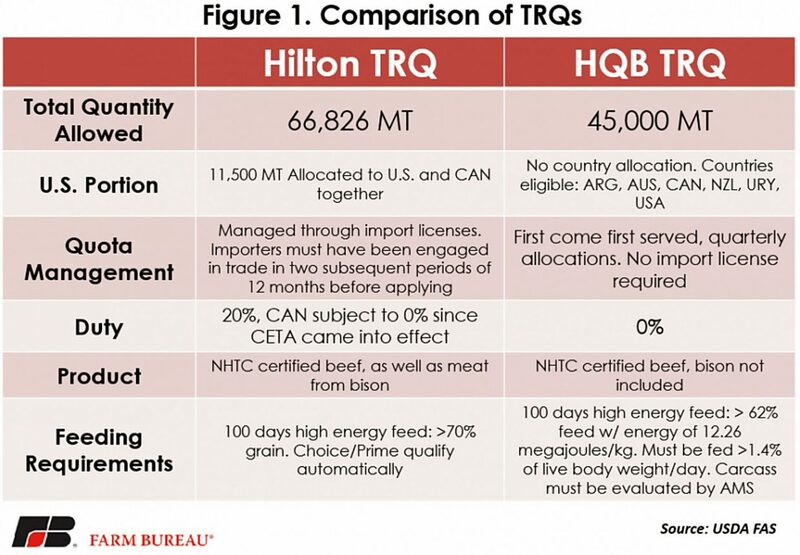 While these are total import numbers as opposed to imports under just the HQB quota, the data reflects the general storyline coming from those involved in exporting U.S. beef: U.S. product under the quota is getting squeezed out by these other countries. With Argentina's and Uruguay's growth coming at the expense of U.S. suppliers, some estimates place the U.S. market share of the quota at less than 30 percent. The HQB quota is also a very competitive quota, which has exacerbated the erosion of the U.S. market share under the quota. 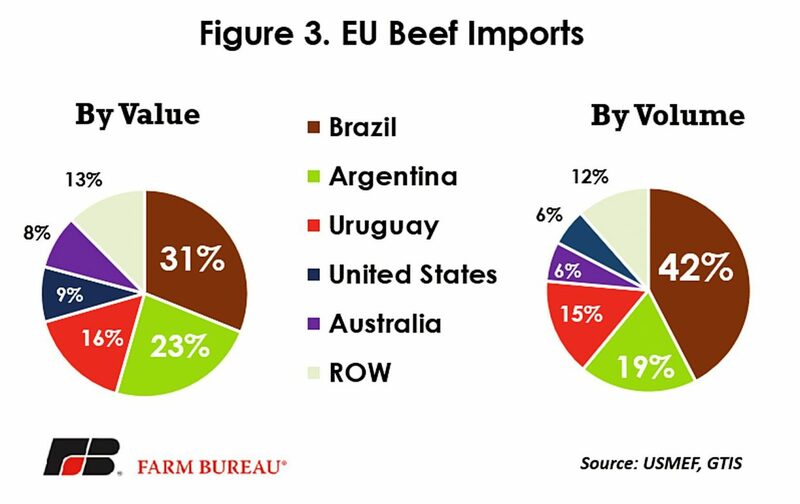 Brazil is by far the largest exporter of beef to the EU, particularly by volume. 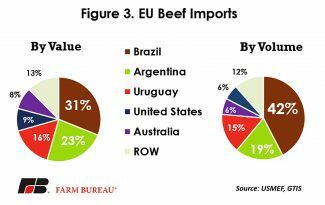 The bulk of Brazil's exports to the EU is lower-quality beef used for processing. 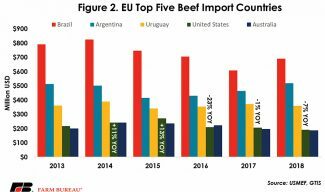 In contrast, the U.S., Argentinian and Uruguayan exports to the EU are mostly high-quality and high-value cuts, leading to a difference in market shares between countries when comparing imports on a value basis against imports on a volume basis. Figure 3 shows the EU's imports both by value as well as by volume. One can see the stark difference between Brazil's market shares, accounting for 42 percent of market share by volume, but just 31 percent by value. 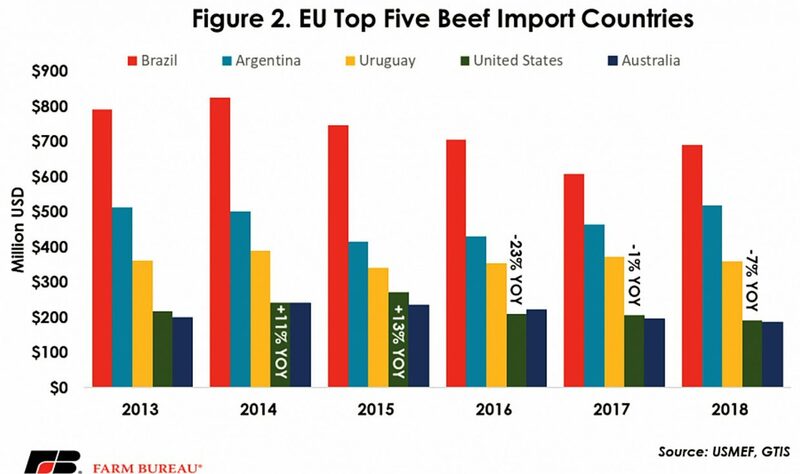 This supports the idea that more of Brazil's imports skew toward lower-quality and cheaper beef vs. the high-value cuts coming in under the quota from other countries. Conversely, the U.S. exhibits an inverse relationship, accounting for 9 percent of imports by value but only 6 percent of imports by volume. The rest of the countries have a similar trend, with the more notable being Argentina, representing 19 percent of imports by volume but 23 percent by value.